The Vatican is a landlocked country with no airport. How did he get there from Zimbabwe if not through a third country? It's typical of these sophisticated EU/UN types. There good at making rules, not too good at enforcing them. Because visitors to the Vatican are protected by diplomatic privilege from the airport to St Pete's. That's the only reason why Mugabe went; I mean he's called the local Cardinal a loonie for calling for Mugabe to be defeated in the recent 'fair' election so he is not the Catholic Church's best friend. The whole point is he craves the attention and that is why he went. If I were Camilla, I wouldn't let the hand that touched Mugabe touch me. Hie' I don't see why there is such a big fuss about President Mugabe shaking hands with Prince Charles. The Prince is true gentleman and he did the right thing, this was a funeral where everyone should share the same goal, which was to mourn the Pope and not to try and express your political views. 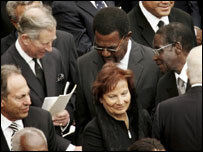 Many rivals shook hands so why criticize Charles for been a true diplomat for shaking hands with President Mugabe. Tony Blair and the rest of his delegation should be ashamed off themselves for fleeing from Mugabe. President of Israel shook hands with the leader of Iran, showing real diplomacy. It’s a shame that Britain still have people who think primitively like Glenys Kinnock.